The Flag of Birmingham was created on the occasion of Birmingham's semicentennial in 1921. It was officially adopted as the city's flag after some minor additions on August 18, 1925. The flag was conceived and designed by Idyl King Sorsby, with the assistance of the Birmingham Jaycees, who created the prototypical flag, constructed in silk, and presented it to the city. The city, along with the Jaycees, presented a copy of the flag to the City of Birmingham, England, and received theirs in return in 1926. 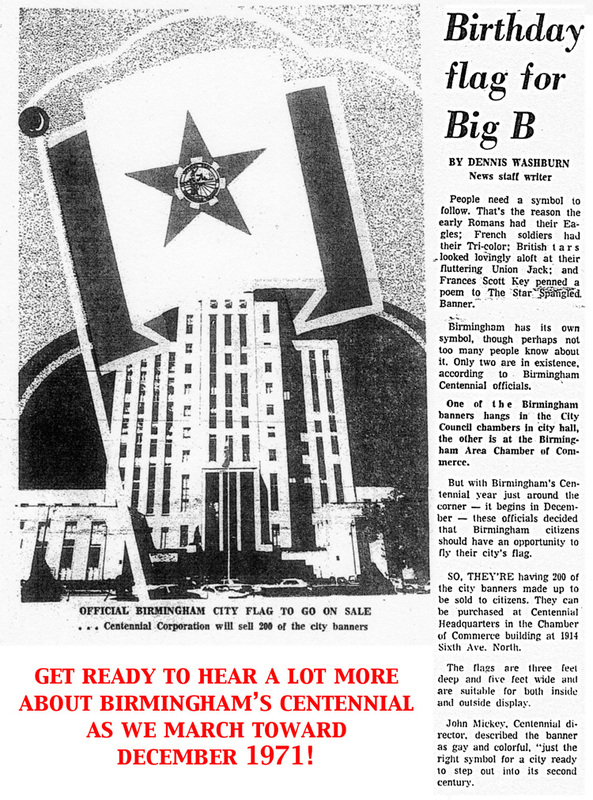 Until Birmingham's Centennial in 1971, only two banners were known to exist: one in the chambers of the Birmingham City Council and one in the offices of the Birmingham Chamber of Commerce. City officials ordered 200 new flags made for sale to the public that year. The white symbolizes the purity of Birmingham's women. The red typifies the valor of Birmingham's men. The gold hints at the mineral wealth of the Birmingham District, and also represents the "high standard of purpose and character" of our citizens. The Seal of Birmingham, inscribed with the date of founding, 1871, occupies a gold-colored "hub" in the center of the star. The hub signifies that Birmingham is considered the industrial, financial and literary hub of the South. The star is circumscribed by a circle of 67 small golden stars, representing Alabama's 67 counties enjoying Birmingham's glory. A radiance of alternating long and short rays outside the circle of stars depict Birmingham's fame and prosperity, and suggests that "all roads lead to Birmingham". The red five-pointed star is inscribed within a circle of 67 small gold five-pointed stars, all pointing outwards, the circle having a diameter of 5.5 units. The seal, black on gold, occupies a 7-toothed gear or "hub" which nearly touches the inner points of the red star. The date "1871" is broken and placed in the spaces between "* OFFICIAL SEAL *" in the upper perimeter and "BIRMINGHAM, ALABAMA" in the lower perimeter. Though specified in the original design, the addition of the date to the seal as used on the flag is often omitted. Radiating out from the circle of gold stars are 85 gold rays, forming a circle 6.5 units in diameter. The rays alternate long and short, beginning with a long ray above the top point of the red star. The longer rays are 1/8th of a unit long and the shorter ones 3/4th the length of the long ones. The association of a red five-pointed star with Communism dates to the Russian Civil War of 1917-1922, first appearing on the uniforms of the "Red Army" and later in the emblem of the USSR in 1923. It is unlikely that Sorsby could have made any connection with that use in her design. Other prominent uses of red stars in the United States before 1921 included the coat-of-arms of George Washington, the flag of California, and the corporate logos of Texaco and Macy's department store. In 2004, the North American Vexillological Association conducted a survey of its 450 members and visitors to its website to identify the best- and worst-designed city flags in the United States. Birmingham's flag ranked #39 out of 150 with a median score of 4.97 on a scale of 1-10. In 2015 a competition for a new flag design was organized as part of Design Week Birmingham. The winning entry, by Jessi Chambliss, consisted of a white graphic inspired by Vulcan's spear point on a red field. This page was last modified on 4 September 2017, at 09:25. This page has been accessed 16,051 times.